^ Muzzey， p. 6; Russell， p. 5. ^ 3.0 3.1 Muzzey, p. 1. ^ Muzzey， p. 5; Russell， p. 5. Blaine, James G. Twenty Years of Congress 2. Norwich, Connecticut: The Henry Bill Publishing Company. 1886. Calhoun, Charles William. Benjamin Harrison. New York, New York: Times Books. 2005. ISBN 978-0-8050-6952-5. Crapol, Edward P. James G. Blaine: Architect of Empire. Biographies in American Foreign Policy 4. Wilmington, Delaware: Scholarly Resources. 2000. ISBN 978-0-8420-2604-8. Doenecke, Justus D. The Presidencies of James A. Garfield and Chester A. Arthur. Lawrence, Kansas: University Press of Kansas. 1981. ISBN 978-0-7006-0208-7. Healy, David. James G. Blaine and Latin America. Columbia, Missouri: University of Missouri Press. 2001. ISBN 978-0-8262-1374-7. McClelland, William Craig. A History of Literary Societies at Washington & Jefferson College. The Centennial Celebration of the Chartering of Jefferson College in 1802. Philadelphia: George H. Buchanan and Company. 1903. Muzzey, David Saville. James G. Blaine: A Political Idol of Other Days. New York, New York: Dodd, Mead, and Company. 1934. Nevins, Allan. Grover Cleveland: A Study in Courage. New York, New York: Dodd, Mead, and Company. 1932. Peskin, Allan. Garfield: A Biography. Kent, Ohio: Kent State University Press. 1978. ISBN 978-0-87338-210-6. Reeves, Thomas C. Gentleman Boss: The Life of Chester A. Arthur. New York, New York: Alfred A. Knopf. 1975. ISBN 978-0-394-46095-6. Rolde, Neil. 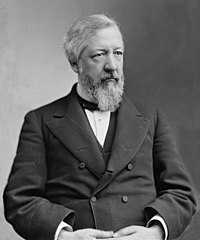 Continental Liar from the State of Maine: James G. Blaine. Gardiner, Maine: Tilbury House. 2006. ISBN 978-0-88448-286-4. Rose, Anne C. Beloved Strangers: Interfaith Families in Nineteenth-Century America. Cambridge, Massachusetts: Harvard University Press. 2001. ISBN 978-0-674-00640-9. Russell, Charles Edward. Blaine of Maine. New York, New York: Cosmopolitan Book Corporation. 1931. Smith, Jean Edward. Grant. New York, New York: Simon & Schuster. 2001. ISBN 978-0-684-84927-0. Socolofsky, Homer E.; Spetter, Allan B. The Presidency of Benjamin Harrison. Lawrence, Kansas: University Press of Kansas. 1987. ISBN 978-0-7006-0320-6. Summers, Mark. Rum, Romanism & Rebellion: The Making of a President, 1884. Chapel Hill, North Carolina: University of North Carolina Press. 2000. ISBN 978-0-8078-2524-2. Unger, Irwin. The Greenback Era: A Social and Political History of American Finance, 1865–1879. New York, New York: ACLS Humanities. 2008 . ISBN 978-1-59740-431-0. Green, Steven K. The Blaine Amendment Reconsidered. The American Journal of Legal History. 1992年1月, 36 (1): 38–69. JSTOR 845452. doi:10.2307/845452. Pletcher, David M. Reciprocity and Latin America in the Early 1890s: A Foretaste of Dollar Diplomacy. Pacific Historical Review. 1978年2月, 47 (1): 53–89. JSTOR 3637339. Rigby, Barry. The Origins of American Expansion in Hawaii and Samoa, 1865–1900. The International History Review. 1988年5月, 10 (2): 221–237. JSTOR 40105868. doi:10.1080/07075332.1988.9640475. Sewell, Mike. Political Rhetoric and Policy-Making: James G. Blaine and Britain. Journal of American Studies. 1990年4月, 24 (1): 61–84. JSTOR 27555267. doi:10.1017/S0021875800028711. Thompson, George H. Asa P. Robinson and the Little Rock and Fort Smith Railroad. The Arkansas Historical Quarterly. Spring 1980, 39 (1): 3–20. JSTOR 40023148. doi:10.2307/40023148. Bastert, Russell H. Diplomatic Reversal: Frelinghuysen's Opposition to Blaine's Pan-American Policy in 1882. The Mississippi Valley Historical Review. 1956年3月, 42 (4): 653–671. JSTOR 1889232. doi:10.2307/1889232. Langley, Lester D. James Gillespie Blaine: The Ideologue as Diplomat. (编) Merli, Frank J.; Wilson, Theodore A. Makers of American Diplomacy: From Benjamin Franklin to Henry Kissinger. New York, New York: Scribner. 1974: 253–278. ISBN 978-0-684-13786-5. Peskin, Allan. Blaine, Garfield and Latin America. Americas: a Quarterly Review of Inter-American Cultural History. 1979, 36 (1): 79–89. doi:10.2307/981139. Tyler, Alice Felt. The Foreign Policy of James G. Blaine. Minneapolis, Minnesota: University of Minnesota Press. 1927.